palaeodeserts project, human bone, phalanx. The finger bone is the oldest directly dated human fossil outside Africa and the Levant. Paleontologist Iyad Zalmout of the Saudi Geological Survey was walking through the Al-Wusta dig site in 2016 when he spotted a tiny bone eroding out of a layer of sediment. 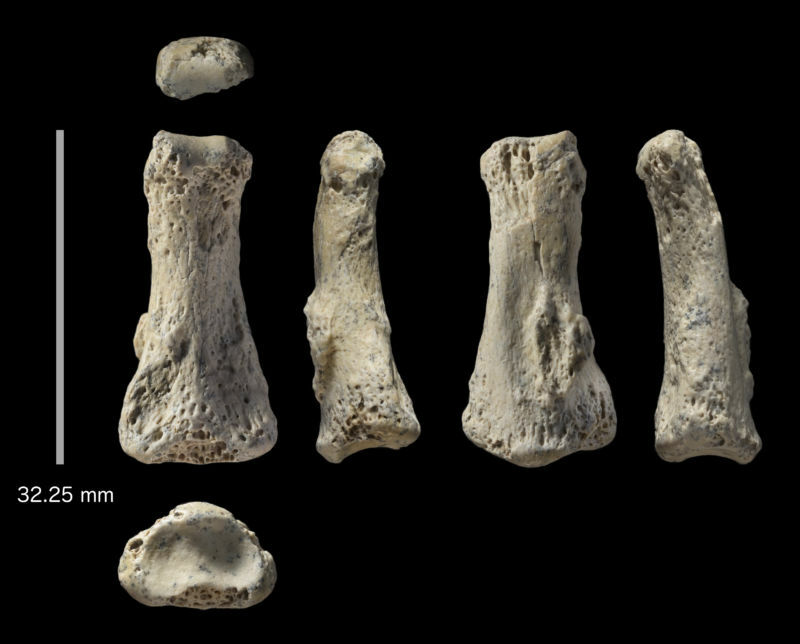 The 87,000-year-old fossil turned out to be a human intermediate phalanx—the middle section of your finger—from what was probably a middle finger. It’s the earliest directly dated human fossil that has been found so far outside Africa or the Levant, and archaeologists say it’s evidence that once humans ventured beyond Africa, they spread farther and faster than previously thought. According to uranium-series dating, the fossil is between 85.1 and 90.1 thousand years old. At that time, the Nefud Desert wasn’t the 40,000-square-mile sea of sand that now stretches across the Northern Arabian Peninsula. Around 84,000 years ago, a shift in the climate brought stronger summer monsoons to Arabia. Based on evidence from layers of sediment at the site and hundreds of animal bones, Al-Wusta was the shore of a shallow lake, one of hundreds in an arid Pleistocene grassland. African antelope grazed here, and hippos wallowed in the muddy waters of the lake. And the site was home to a few dozen hunter-gatherers, according to Oxford University archaeologist Huw Groucutt, who directed the fieldwork at the site. The people who dwelled here 87,000 years ago lived in a fairly densely populated landscape by the standards of the late Pleistocene. Groucutt and his colleagues have identified several other ancient lakes over the course of a decade of survey and excavation in the region, and many of them have their own stone tool assemblages, a sign that several hunter-gatherer bands roamed the lake-dotted landscape at around the same time. But Al-Wusta is the first site where archaeologists have found actual remains of those early settlers. A team of biological anthropologists at Cambridge University took CT scans of the bone and compared its shape, dimensions, and proportions to the same bone in other hominins, nonhuman primates, and early and modern humans (if you want to compare the Al-Wusta bone to your own finger, it was 32.3mm long and 8.5mm wide at mid-shaft). Human fingers are much longer and more slender than those of Neanderthals and not even close to any of the nonhuman primates in the comparison group. The team has pretty much ruled out DNA testing; since the bone has completely mineralized, it’s highly unlikely that there’s any DNA left. And the fossil doesn’t reveal much about the individual’s age beyond the fact that they were probably an adult. A finger bone isn’t much to go on if you want a person’s life story, after all, but the phalanx does offer one interesting detail: this ancient human did a lot of hard work with his or her hands. The finger bone sports a bony lump called an enthesophyte, which forms as a response to repeated physical stress where ligaments or tendons attach to the bone. This entry was posted on Monday, May 21st, 2018 at 00:05	and is filed under Uncategorized. You can follow any responses to this entry through the RSS 2.0 feed. Both comments and pings are currently closed.